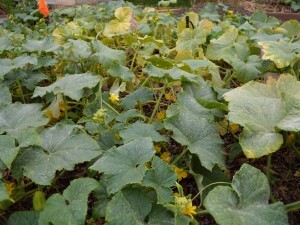 Last year, in a bid to make my own version of our favorite sandwich fixing, I planted two Bushy Pickling cucumber plants. They cranked out a phenomenal number of cukes, and I soon found myself in desperate need of a pickle recipe. I was too intimidated to try the traditional fermentation process, and too hell bent on a winter larder to opt for refrigerator pickles. Instead, I chose the middle path: fresh-pack pickles. But, before we go on, a novella on canning safety. I have hesitated in the past to share canning recipes or information because of the serious safety concerns that go along with home canning. Botulism is a bacterial nerve toxin that can crop up in improperly canned foods. Low acid vegetables are especially prone to botulism contamination and pressure canning is used for this reason. I don’t own a pressure canner, so I am more limited in the types of foods I can, and I take care to follow recipes from reputable sources and make my canning process as hygienic as possible. The CDC has a helpful and very sobering page with information on botulism here. Water bath canners are not suited for canning low acid vegetables. 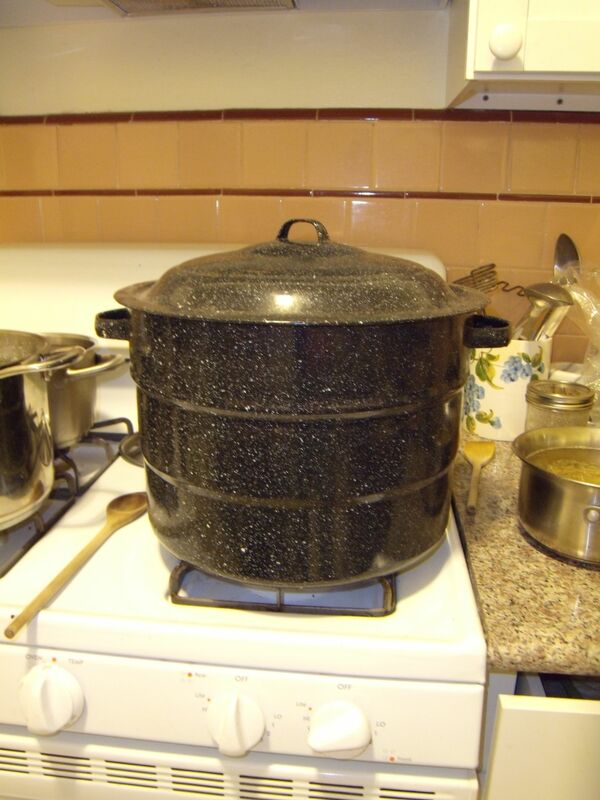 I learned to use a water bath canner in my grandmother’s kitchen. She was a stickler for hygiene, but I never saw her use a recipe, or refer to a list of CDC guidelines. I’m sure many people can this way, and many people get away with it. However, don’t take my word for anything. If you are new to canning, educate yourself on the dos and don’ts and avoid even the most remote possibility that you will seriously injure or kill yourself or a loved one. I don’t mean to be overdramatic here, but I really do believe in the importance of taking safety risks seriously when canning. Here is a link to the USDA Complete Guide to Home Canning. The original recipe that I stumbled across last year in my quest for fresh-pack pickles is courtesy of Duluth Community Garden Program. My take on the recipe was such a hit in our pickle-crazed household that I resurrected it for this year’s round of pickling. First, gently scrub the cucumbers to remove spines. This is most easily done just after picking, and it’s important to make the pickles right away to prevent mushiness. Kelly says time of harvest is also important. Cucumbers picked and canned early in the morning will be more crisp than those picked later in the day. While you’re working, sterilize jars and lids per canning jar instructions. Prepare all other ingredients—cut large cucumbers to size and taste for any bitterness, slice onions, peel garlic cloves, and wash dill, peppers, and grape leaves. Combine brine ingredients in a large pot, stir, and bring to a boil. Depending on how many cucumbers you have, you may need to double, triple, or even quadruple the brine recipe. My last batch of pickles used 4.25 lbs. 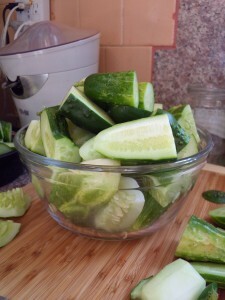 of cucumbers for a total of seven quarts, and I almost used up my triple batch of brine. The original Duluth recipe is way off when it asserts that one batch of brine is sufficient for six quarts of pickles. Remove hot jars from water bath and add ingredients, stuffing cucumbers in last. Using a canning funnel, ladle boiling brine into jars and fill to within ½ inch of rim. Wipe rims with clean paper towels. Place hot lids on jars and screw closed finger tight. Return jars to not-quite-boiling water (you don’t want them to break!) and turn the heat up all the way. Process for 10 minutes, counting the time from when the water returns to a simmer. Remove jars from water, placing them on a wire rack, board, or, if you’re like me, a towel on the living room floor. Do not disturb the jars or tighten the bands for 24 hours. The cucumber plants are looking a little worse for wear at this point in the season, but I’m crossing my fingers for one more batch of pickles. 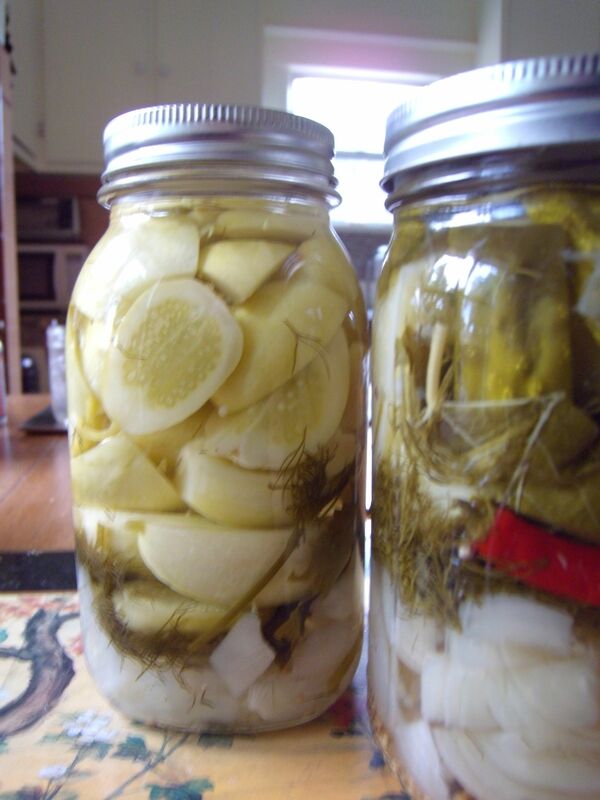 Thank you for sharing your pickle recipe! I am crazy about pickles, and I can’t wait to try it! Glad you’re going to try the pickle recipe, Katie! I don’t think you’ll be disappointed :).